Aiersi SU-074PE Koa Conert Ukulele 24" Electric Ukulele Concert Size 24" Open..
Aiersi SU-084 Spalted Maple Concert Ukulele Top,Back and Side: All Laminated Spalted..
Aiersi SU-201 Long Neck Soprano Ukulele Top: Laminated Java Ebony Back and Side: Laminated J..
Aiersi SU-204 Java Ebony Concert Ukulele Top: Laminated Java Ebony Back&Side: Laminated ..
UKE100 Soprano Ukulele A super-portable way to bring a summer vibe to your next campfir.. The new G9101 NYC Camp Uke is a must-have for every uke collector! A faithful recreati.. The miracle of volume! 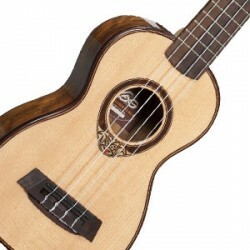 When you play chunk rhythm, finger-style, bottleneck or anything else, th..
For authentic tone and appointments at an attractive price, look no further than this good-time ..
Hal Leonard Ukulele Method Book (Audio Access Included) ..
Kala Tenor KA-TEME with UK-300-TR EQ Specifications: 17” Tenor Scale 26 3/8” ..
Ukadelic Series by Kala The “Ukadelic” series features “audacious” new gr.. Body is all wood construction. 13-11/16 Soprano Scale (Distance from Nut to Saddle) 21 O..
KALA KA-SMHCE-C UKULELE Features There is a traditional, vintage look and sound to these all s..
Luna Ukulele Concert "Radioactive" w/bag The Concert Ukulele (or Alto Ukulele), is the ..
Art Series Ukulele It's a cute smiley face and who can resist to own one of this? The U/S..